We’re here already. 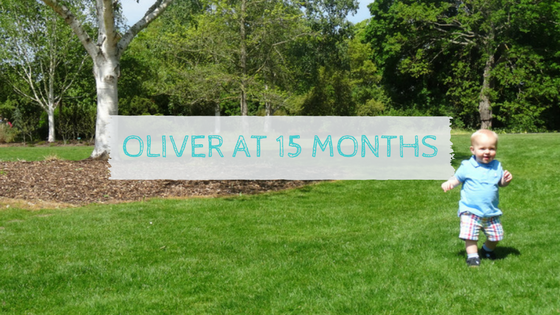 These months are passing us by so quickly, and Oliver is changing so quickly with it. This month has been a month of change here. Oliver has officially become a toddler. He’s a walking, talking whirlwind, that barely ever stops! You’re still a brilliant eater. We are making progress on lunches too, snack plates are definitely your thing. Rather than a sandwich, you seem to enjoy lots of bitesize bits. I’m getting less worried about the fact you won’t eat sandwiches, to be honest I’m not a massive fan either! You have a very big appetite, when I make you porridge for breakfast you eat a portion that I would be happy with! I’m not sure where you put it because you’re still a petite little thing. You’re walking!! Hooray! It was Easter weekend and we were at my mums house and you decided to take those first steps, in exactly the same place you started crawling confidently as well. There was no stopping you and you’ve been walking ever since. I think the only times I’ve seen you crawl is if you’re underneath something and can’t stand up! You’re almost at a point of trying to run (well you have tried to run, but this often ends up with you falling over). We are so proud of you, and you’re most certainly a toddler now! Another milestone here, you can say mama! I’m feeling all the love right now because mama is quickly becoming a well used word, but it’s usually said in the context of ‘get me that mama’ or ‘feed me mama’. But I’ll take it! You’ve turned into such a chatterbox this month. You haven’t stopped chattering away, and we are starting to learn what certain sounds/words you say mean. Car is still you’re number one word. We open the curtains in the morning and the first thing you say is car when you see it parked on the driveway! You’re still the cheeky chappy you’ve always been. You’re determined and focussed and if anyone gets in your way you will go into full meltdown. God help us when you reach the terrible two’s because you’re stroppy enough as a one year old! However you are becoming much more affectionate. You have started properly giving us cuddles and kisses, which both daddy and I love. It’s so nice to see this loving nature coming out, and you will kiss anyone who asks (Uncle Alex got 3 birthday kisses, the lucky man!). You’re still a little squirt. You’re definitely taking after your parents and being a skinny little thing (not that I’m skinny now but I was when I was little!). Height wise you’re pretty average, but you’re just so tiny around the middle. I’m really struggling finding trousers that stay up. 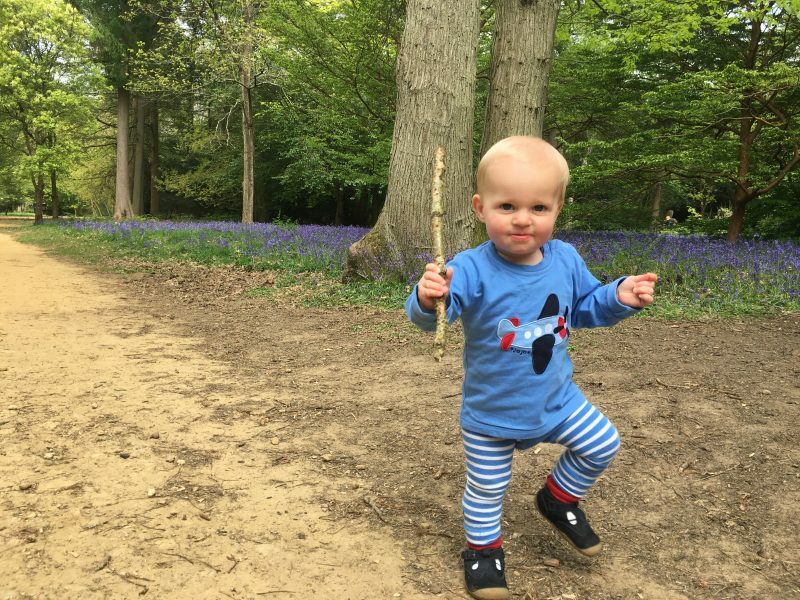 You’re still in a lot of your 9-12 month clothing, 12-18 month clothing swamps you still, when I do dress you in them the sleeves and legs all need to be turned up and the trousers are constantly falling down! It’s a pain because your 9-12 month trousers are too short, they need an interim size! Your teeth have really bothered you this month. Although you won’t let me look in your mouth properly, I’m pretty sure you’ve had about 4 come through, some premolars and I think the other day I saw a molar popping through. No wonder you were such a grump! We’ve had plenty of trips out this past month. 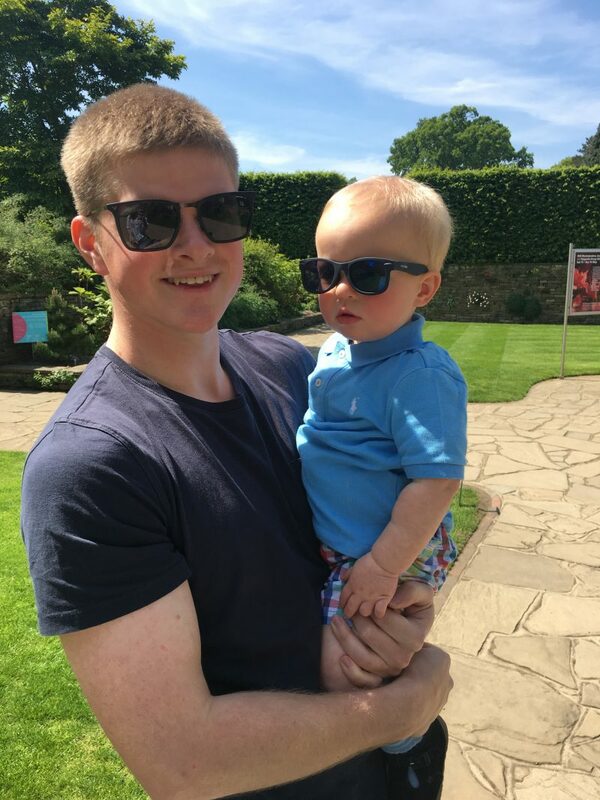 We have been to Wisley gardens a few times, last week it was beautifully sunny and you had lots of fun running around in the sunshine, you even have a little tan! We took a trip to the farm the day before you started walking, we were hoping it would motivate you to get moving and it must have done the trick! We also took your belated birthday trip to the Sea Life Centre in London. We had lots of fun, although you slept most of the way around so we took it very slowly so you didn’t miss too much! I filmed our day out for my Youtube channel. I loved watching all of the fish, it’s so relaxing and you seemed to like them too. Last month we also made the trip to Little Street in West Byfleet so I could review it, you had a great time, I’m sure it will become a firm favourite as you get older. Easter flew past us, Stu had to work the whole weekend so we spent most of the time with granny and auntie Alice. Your great aunt and some of my cousins came over to see us, we had lots of fun and you have developed a good knack at sniffing out chocolate/easter eggs! So that’s your 15 month update, another month has passed us by so quickly, but we are loving every day we have with you! Previous Post Happy International Nurses’ Day! Goes by in a flash right? Aww, he is growing into a lovely little man. 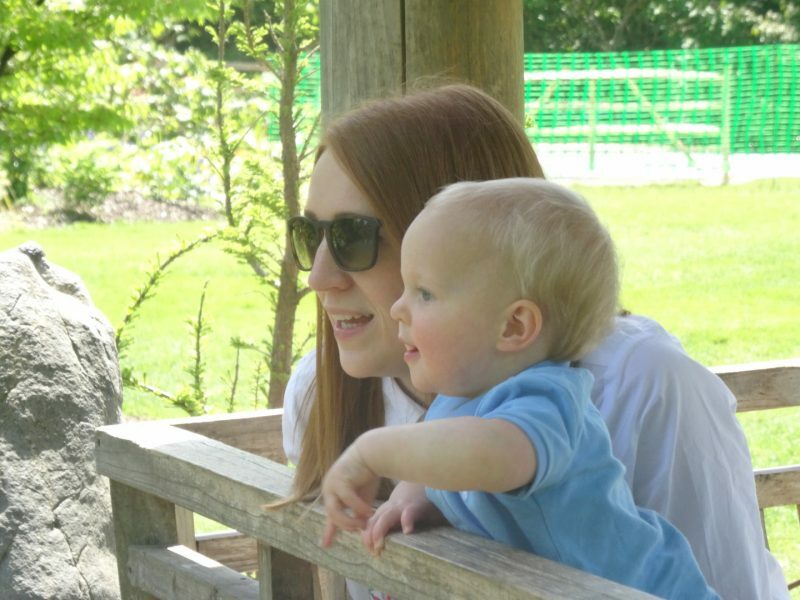 chickenruby recently posted…Are you a good social media role model to your children? Aww, this is all just heart melting…! It must be amazing to hear him say ‘mama’!! 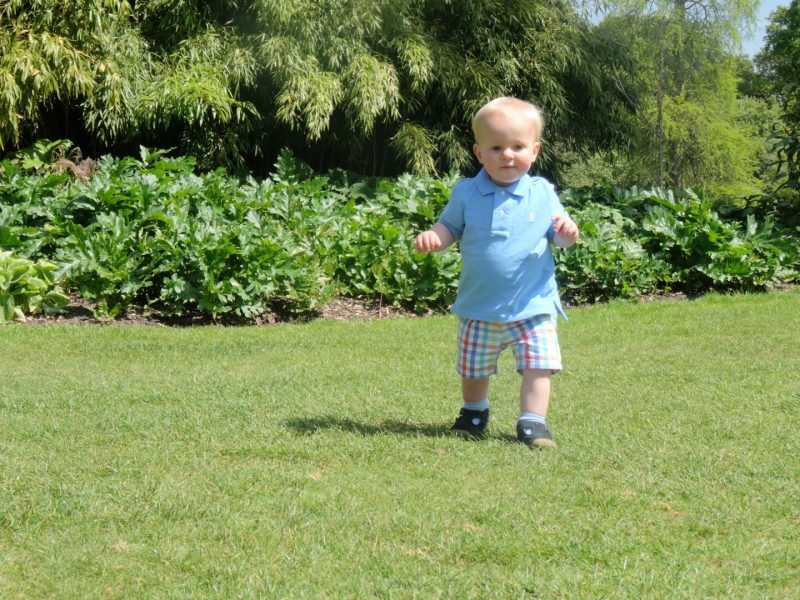 And you can see his personality in the lovely pictures-I love his stripy leggings and aeroplane top outfit! My boys had a pair of stripy leggings, and I loved them in them so much, it was pretty much all I put them in! Thanks for sharing this little cutie with us! 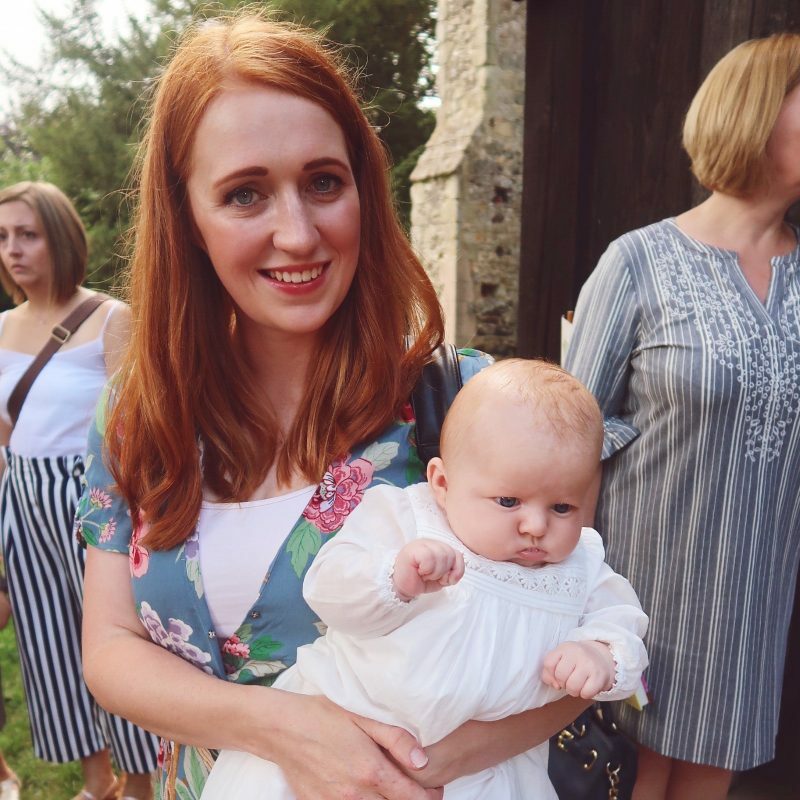 This Mum’s Life recently posted…The Big Pink Link Week 61! ahh Oliver you’re getting so big!!!! He really looks so confident on his feet now! We MUST arrange a meet up with our boys somehow!